By now everyone has heard the most popular buzzwords in the world of enterprise information. Terms like “data warehouse”, “big data”, “business intelligence”, and “machine learning” are everywhere these days. But a new term has been gaining a lot of traction these last few years, and that term is “fast data”. Fast Data isn’t a replacement for any of these previous concepts. Rather, it’s the latest application of them. The Fast Data trend is the acknowledgement that information acted upon in real time is significantly more valuable to an organization than when it is examined in a regularly scheduled report. Traditional approaches to intake, warehousing, processing, and reporting don’t allow businesses to react to some types of data before it becomes irrelevant. Applications like IoT deployments, social media, web analytics, and mobile usage can demand that real-time actions be taken on trends contained within many terabytes of data. That’s where Fast Data comes in. If your customers are going to benefit from making real-time business decisions based on large amounts of data, they are going to need help. Fast Data isn’t just about the technology which makes it happen. It’s about investing in business practices around monitoring and analytics, alerts to significant events, and plans to take quick, corrective actions. HDInsight: Apache Hadoop (and related projects) implemented in Azure as a scalable service, ready to use without the planning required to run Hadoop on-premises or in cloud virtual machines. Hadoop itself is a set of services which work together to support big data solutions. Data Lake Store: A repository for incoming data, kept in its raw, heterogeneous form. Data Lake Analytics: A scalable service for executing data analysis queries on heterogeneous data without having to manage the underlying processing power. Data scientists who need to get started building their solutions now without worrying about future capacity. The “Big” in “Big Data” is hard to plan for – both from a storage and from a processing power perspective. Implementing Big Data in Azure lets customers focus on results instead of capacity planning. The Azure Data Lake suite of solutions is used to capture data from multiple sources and perform analytics across the data set without requiring transformation into a homogenous form. For more information about Azure Data Lake and its offerings, check out the Apache Hadoop project overview, as well as Microsoft Azure’s Introduction to Hadoop and Exploration of Data Lake. Also worth reading up on is developer Tom Kerkhove’s blog about Azure Data Lake. SQL Server Analysis Services is an online analytical data engine for business reports and client applications, including Power BI and other data visualization tools. Application Developers and DBAs with on-premises data in SQL Server and other stores such as Oracle or DB2. Microsoft’s solutions for Fast Data are not just limited to Azure. Plenty of companies have on-premises data in SQL Server which needs to be analyzed to provide Business Intelligence. SQL Server Analysis Services continues to be improved upon, with a major update released just this year. When combined with Power BI, it can be an effective tool for supporting real-time decision making. Great resources to learn more about SQL Server Analysis Services include the latest updates to Analysis Services, more information, tips and announcements straight from the product team, and this helpful breakdown of the data sources you can use. Azure SQL Data Warehouse is a variation of Azure SQL Server capable of storing and processing massive volumes of data, both relational and non-relational. Developers, DBAs, and data scientists who need to build a Fast Data solution using a more traditional approach than Data Lake, either to leverage existing skill-sets or because the data sources are more homogeneous, as with LOB data applications. Azure SQL Data Warehouse is great for enabling Fast Data using existing tools like SQL Server Analysis Services, Integration Services, and Reporting Services and is a bridge to born-in-the cloud services like Stream Analytics, Machine Learning, and Power BI. It has a unique feature of allowing customers to independently scale storage and compute resources, going so far as to spin down the query engine while leaving all data in place, ready to resume when the project resumes. Helpful information about the Azure SQL Data Warehouse is available in the service overview page and in the SQL Data Warehouse guidance material. Azure Machine Learning is a cloud service that enables you to build, deploy, and share predictive analytics solutions. Data scientists who want to apply the latest in forecasting algorithms using a drag-and-drop interface and developers who want to include data science intelligence in their software though a simple API implementation. Machine learning, as a general concept, provides a sneak peek into the sci-fi future where computers stop telling us what did happen and start telling us what may happen next. Microsoft’s cloud services version of machine learning is the best-of-breed approach to the concept, packaged and ready for easy use. No PhD required. Learn more about Azure Machine Learning through the service overview and Info World’s article on How Machine Learning ate Microsoft. Azure Stream Analytics is a managed, cloud-based process created specifically for real-time event processing on incoming Big Data sets like those from IoT devices, sensors, web sites, social media, applications, infrastructure systems, etc. Data scientists and enterprise developers wanting to take a fresh approach to Fast Data while benefiting from years of Microsoft Research work in processing time-sensitive data. The other solutions here assume some workflow of intake, storage, and then processing. Stream Analytics enables truly real-time decision making by performing the analytics on a continuous flow of information, in the moment. Check out the detailed overview of Stream Analytics and Executive VP Scott Gu’s blog on real-time data streaming and data factory services. Power BI is an interactive data visualization deployed either as a stand-alone dashboard or embedded within a desktop, web, or mobile application. Enterprises who need a ready-made dashboard for delivering their real-time results and developers who would like to provide an interactive data dashboard into their applications. Power BI is an attractive and modern approach to leveraging the analytics provided by any of the solutions discussed in this article. For further insight into Power BI and how it can help leverage the Fast Data trend, visit the product page and the service overview. Hopefully this quick overview has provided a helpful look at several of Microsoft’s offerings in this exciting and growing area. 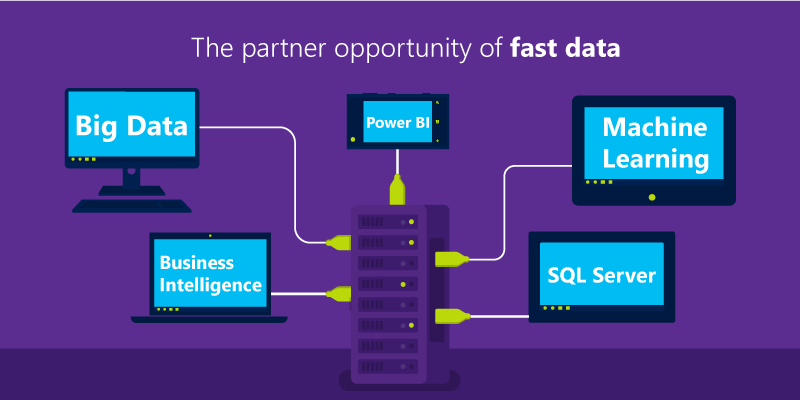 Microsoft Partner Network members don’t have to be experts in all aspects of Fast Data to benefit from the opportunities it provides. Being able to answer business questions like “Why should I use HDInsight instead of installing Hadoop in my data center?” can be enough lead to a valuable new cloud implementation project. How do you use Fast Data to accelerate your business? Are there certain Fast Data tools you’d like to know more about? Let us know and feel free to ask any and all of your questions in the comments below.